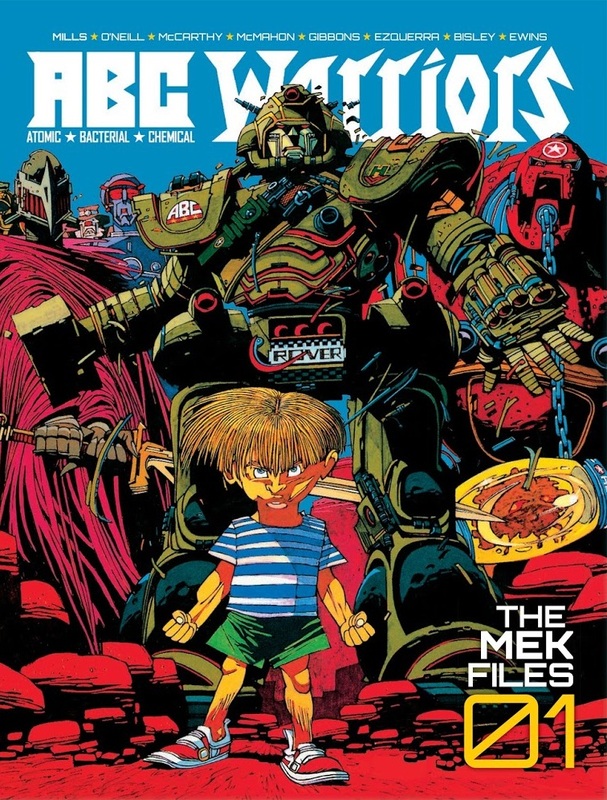 The first bulky collection of ABC Warriors is far more schizophrenic than later Mek Files, combining the episodic first run from 1979 with the 1988 revival that kickstarted a feature believed dead, and generated a strip still continuing thirty years later, although with large gaps between series. More than any subsequent collection it’s an absolute artistic treasure trove, now best known for introducing Simon Bisley, but that’s a shameful disregard for some stunning work from others. It had been intended that Kevin O’Neill and Mike McMahon draw the original series, but deadlines were shifted on O’Neill, and he ended up contributing character designs, but only actually drawing two episodes in his spiky updating of Hieronymus Bosch’s nightmares. 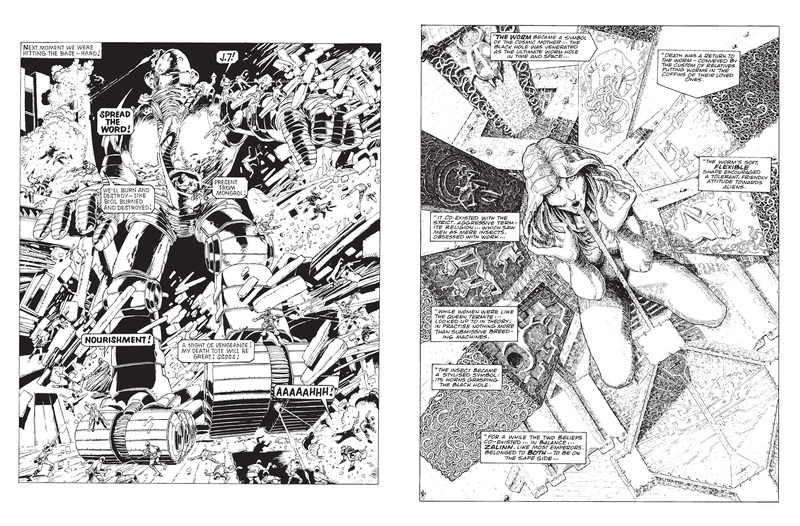 The contrasting styles of Brendan McCarthy, McMahon (sample art left), Brett Ewins, Dave Gibbons and Carlos Ezquerra followed, some more imaginative than others, but almost all good. This content had previously been issued over two collections by Titan in the early 1980s, then combined by Rebellion as The Meknificent Seven, while the longer second portion had seen print as The Black Hole. It should be noted this edition restores colour to splash pages always in black and white in previous collections. ABC Warriors developed from Pat Mills’ plan to launch a comic exclusively presenting stories about robots. That proved stillborn, but some ideas he developed found their way into the opening series, where a bunch of robots were first gathered, then tasked with bringing order to the wild frontiers of human colonised Mars. Mills has since talked of the difficulties of tailoring his stories to the different artistic styles, but it’s not something that comes across in what are a varied selection of creative adventures infused with a wealth of great throwaway ideas. 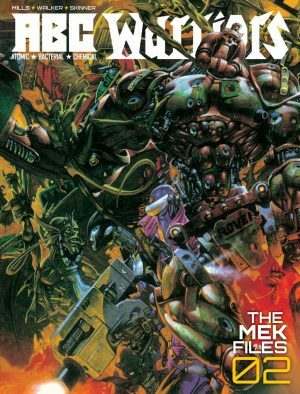 The variation allows for contrast, so McMahon’s great story about a skyscraper sized robot is crowd-pleasingly sentimental, while rampaging robo-dinosaurs provide meat and potatoes work for Carlos Ezquerra. It may have been hard work for Mills, but the sheer variety ensures these earlier stories are still very readable. That’s not always the case for the hit and miss 1988 content. Mills has a more structured approach, but it takes some while to coalesce into purpose. He’d reintroduced the ABC Warriors in his Nemesis continuity, a convoluted story of conflicted good against primal evil, and they were now a slightly modified line-up working to save Earth and humanity, although in a more abstract fashion than that might suggest. Serialising a structured story enabled Mills to investigate his cast set against a wooly and confusing threat of time particles leaking into the wider universe. Mills provides a reason for seven ABC Warriors being required, but these are conflicting personalities with differing motivations involving twisting deceptions. As noted, this was Bisley’s first comics work. There’s a primal energy to his pages, featuring inspired and unrestrained robot on robot action, Bisley at times obsessed with drawing into the mechanics of the characters and at others supplying wild, slashing silhouettes, the lines almost etched onto the page. What he can’t do is tell a story, and Mills’s scripts very obviously work around this after a few episodes. The other artist, SMS (sample art right), has been all-but forgotten, which is astonishing. Had his work appeared in the 1970s Metal Hurlant he’d be remembered to this day for his imaginative science fiction layouts, his detail and his strong sense of storytelling. 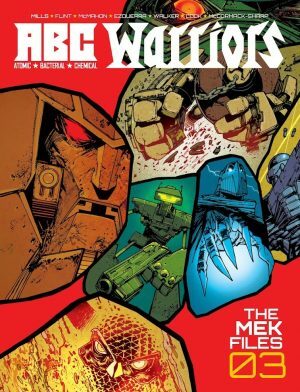 The art alone makes Mek Files 01 a great buy, but Mills surprises throughout, and even in episodes where it seems the plot is lost there’s always a great throwaway idea or some nice insight. Jarjazz!